We show you some of our favourite European Luxury Vehicles from the upcoming Gosford Classic Car Museum Closure! Australians are buying luxury cars more than ever before, and it’s not looking like slowing down any time soon! Aussies have proved their love of tailored luxury brands, mostly hailing from Europe. Of course, the largest privately-owned classic car collection ever to be auctioned in the southern hemisphere is going to feature some incredibly luxurious European classics. Over 30 of them in fact! This is a rare opportunity to see a collection of iconic names together; Aston Martin, Bentley, Jaguar, Maserati, Porsche, Lamborghini and Ferrari. We have chosen six of our favourites as a taster of what’s to come in this incredible auction this weekend. These cars are cemented as one of the most iconic classics of all time. Considered by many (including Enzo Ferrari) as one of the most beautiful vehicles ever built, the E-Type was undoubtedly a milestone vehicle for Jaguar. As you can see, this particular 3.8 Series 1 Roadster presents in outstanding condition and is one of the most desirable E-Type specifications ever built! With a black exterior over a red leather interior, this classic received a detailed, bare-metal restoration. It included several upgrades to increase drivability while still preserving the car’s original look. Producing 265 brake horsepower from its 3.8L inline six-cylinder engine and paired with the smooth shifting four-speed manual gearbox results in a flawless driving experience. Accompanying this E-Type is its comprehensive restoration receipts, a Jaguar heritage certificate, operating handbook and its previous ownership history. 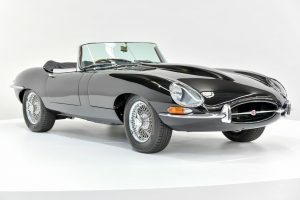 The E-Type’s initial success in the early 1960s has transcended time making it a highly attractive, but rarely available, addition to any collection. The DB series was named in honour of Sir David Brown who was the owner of Aston Martin from 1947 to 1972. Although it was not the first in the series, the DB5 is the best known. The Aston Martin DB5 is one of the most famous cars in the world as it was the choice of James Bond, firstly appearing in the 1964 film, Goldfinger. With the world watching the DB5, armed with machine guns, smoke screen, revolving number plate (and everyone’s favourite, the ejector seat), defeated the villains and made everyone want one of these iconic cars. This stunner presents in Silver Birch paint over the original Dark Blue Connolly leather trim interior and features a Webasto sunroof… A handy accessory if ever fitted with the James Bond ejector seat! The interior of this car proves it is a true original with its correct Smiths gauges and timepiece, door trims, timber rimmed steering wheel and the gear shifter. Only 1,021 DB5s were built and they rarely change hands, so this is a true collector’s dream and a must-have! If you were an ‘80s child, you probably had the poster on your wall… Well, here is the real thing. As one of the very first 5000QVs delivered to Australia, this breathtaker was flown to Sydney in July 1985 and sold new out of “The Toy Shop” in North Sydney. This Lambo presents in a completely original, unrestored condition and boasts the classic colour combination of Rosso Siviglia with a black interior. It truly captures the essence of an Italian Supercar. As 1 of less than 100 right-hand-drive examples built, this Countach has travelled only 69,970 km since new, and has been meticulously maintained over the years. Fitted with a 5.2L V12 engine, a five-speed manual gearbox and rear wheel drive, you won’t want for anything else! As one of the most recognisable and iconic vehicles ever produced, this car is a true time capsule, a failsafe investment, and would complement any collection. The Ferrari Superamerica features a glass panel roof which retracts in 60 seconds by rotating 180°, then storing away by laying flat over the boot of the car. Only 559 retractable hardtop models where ever built. This particular Superamerica is one of only six that were Australian delivered and it displays the iconic Rosso Corsa coloured paint with a beige interior. It is a convertible adaptation of the acclaimed 575M Marinello and shares the same front mounted 5.7L V12 engine. However, a higher output tune made the Superamerica the fastest convertible in the world at the time, with a top speed of 320 kph! This Prancing Horse has a low 9,664 km on the clock and features the semi-automatic electrohydraulic six-speed manual gearbox. The Superamerica was the first V12 Ferrari to receive this ‘F1’ inspired paddle shifter, providing near instant gear changes and delivering the exhilarating driving experience that Ferrari is so well known for. It was also the first production vehicle ever to feature an electrochromic glass panel roof. This is the perfect addition to any established collection and is also a genuine investment opportunity. Maybach has a long history of magnificent luxury dating back to 1921 and built some of the finest cars the world had ever seen. Although they are a masterpiece of modern engineering, Maybach sales were slow due to their unique styling, and therefore only 3000 were produced between 2002 and 2013. This 2007 Maybach 57S was sold new in Australia and was one of only six models to enter the country. Its rarity and lavishness meant it came with a price tag of $1.1 million, earning itself the title of ‘Million-Dollar Maybach’! This beauty features the 6L V12 BITURBO engine producing 603 brake horsepower and a top speed of 275 kph. The list of luxury, style and performance features this car has is endless. It showcases a comprehensive Bose sound system and audio-visual system with DVD players and twin screens in the back. With a huge amount of legroom for comfort, this car is ideal for long distance travel. Today this car presents in near new condition and represents tremendous value when compared to the new luxury car market. This is a vehicle that was certainly ahead of its time! Porsche’s 911 range took over from the successful 356 in 1963 and has been considered the best driver’s car ever since. Years of development have resulted in Porsche’s latest masterpiece, the limited edition, 911R. This particular 911R is #699 of 999 made. With only 29 examples delivered to Australia, they sold out instantly, making them an instant classic. This is the lightest road Porsche available. It uses magnesium polycarbonate and carbon fibre to save weight, making it 50kgs lighter than a GT3 RS! The six-speed manual gearbox is considered one of the best pieces of engineering Porsche has ever put into a car. The performance from the flat 6 non-turbo engine is also staggering. With 268 kilowatts, this beast reaches 200 kph in 11.6 seconds and goes on to reach a top speed of 323 kph. The interior is a mix of modern-meets-retro with carbon-fibre, leather seats and classic tweed inserts capturing elements of past models. Presenting as new, this car will please even the fussiest of buyers. If you want to keep up to date with all our unbelievable Classic Car auctions, then simply pop your email address below and we will send notifications directly to your inbox!